A man exposed himself to a woman outside a railway station in West Lothian. The sexual offence was committed by the young man around 5pm on Monday, February 20 near the north car park of Uphall station. The woman drove away from the scene of the incident unharmed. The flasher had been seen loitering in the underpass area around 20 minutes before. He is described as white, around 5 ft 5ins – 5ft 6ins, slim build, with short dark hair, wearing a black beanie style hat, grey/navy blue hooded top with light blue “adidas” stripes from shoulder to elbows on the jacket, blue jogging bottoms and white trainers. 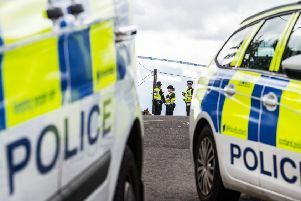 Police are appealing for witnesses and believe the man had been in the area in the weeks or days before the incident. Investigating officer, Det Con Thomas Griffin, said: “People who use the railway station frequently may have noticed him and may be able to assist the investigation. We have been conducting increased patrols in the area as a result.